"My J1 experience can be said to have started in my second year of college, sitting in a bar with a friend talking about the travels we dreamed of over a casual pint which inevitably turned into four. 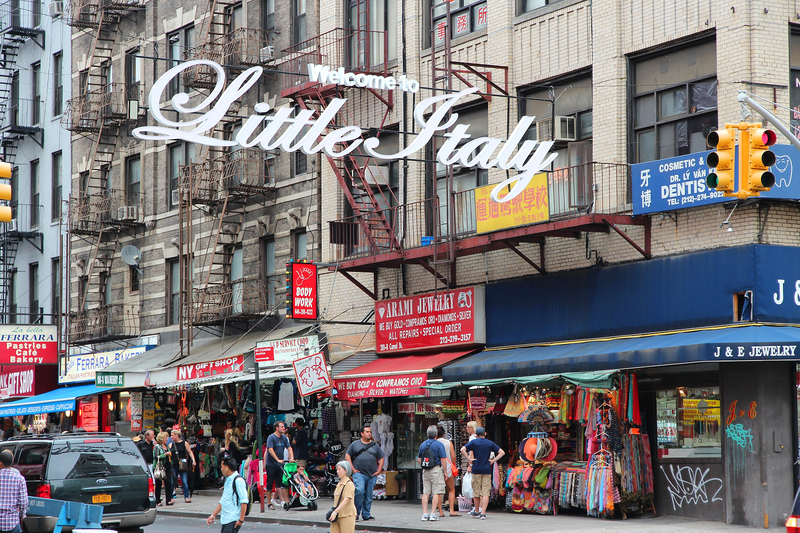 One city began to take centre stage in our discussion, that city was New York. Our pints were pushed aside in favour of a notepad and pen used to sketch a haphazard budget. Despite all the odds of plans made in pubs being stacked against us, we made it to New York the following summer. With only a week to see everything, the race against the clock was on. 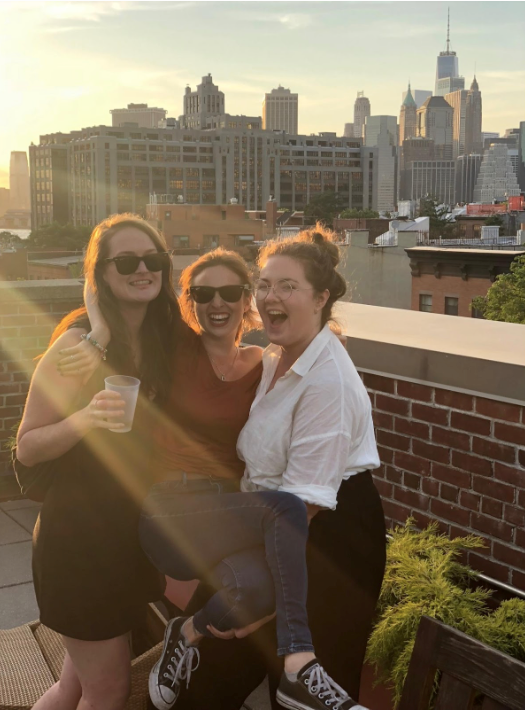 Seven days, two Broadway shows and a few too many dollars later our bodies were on the plane back to Dublin but our hearts remained unflinchingly in New York, our pulses entangled with that of the city that never sleeps. Flash forward another year and the bittersweet nostalgia that accompanies the final year of any degree is encroaching. With the undergraduate era coming to a close and the door to adult life creeping open, the need to create one more memory grew strong. We racked our brains for that one last chance for escape, we needed an opportunity to end that portion of our lives with an unforgettable bang. In as telling a contrast as any, while the second year decision was made over pints, the fourth year decision was made over tea and chocolate. A couple more friends were roped in and a much bigger budget was constructed. New York was calling us back, and we had never been more ready to answer. As the weight of final assignments grew ever heavier on my exhausted fourth year shoulders, New York became much more than a geographical destination. 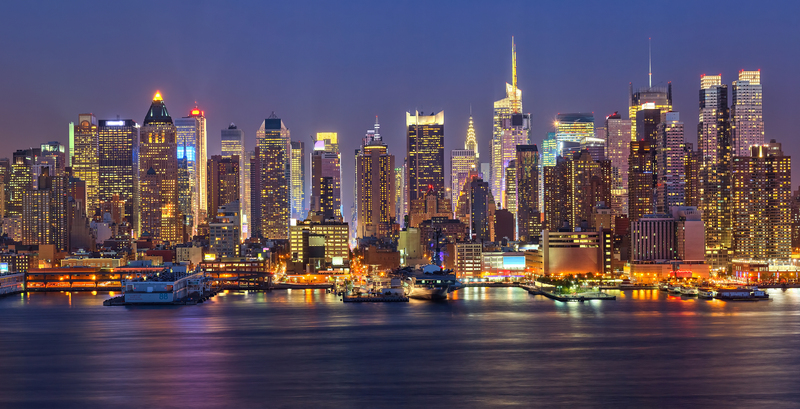 The Manhattan skyline became a sparkling light at the end of a long, painstakingly academically-referenced tunnel. That was one of the coldest winters Ireland had seen in a long time, snowing the nation indoors. As heating systems failed and bread supplies dwindled, New York promised a summer of warmth. In every dark moment another attraction was researched, another restaurant savoured over, another Broadway musical imagined. After what seemed like an unending academic year, the day finally arrived and I took flight to the city of my dreams. I planned to have three weeks of holiday time before work would begin, forcing me to return to reality. Those initial weeks saw me traipse through the five boroughs of New York, soaking up every experience available, taking a moment at the end of every day to cross another handful of items off the bucket list I had spent the preceding year compiling. A massive highlight of those weeks was going to see A Bronx Tale. As the first Broadway show of my J1 it will always hold a special place in my heart, it would be the standard against which all ensuing musical theatre experiences of that summer would be compared, it would act as my unofficial soundtrack for many a jogging route or late night subway ride in the coming months. Live theatre has always been a passion of mine and in New York I could not have found a city better suited to fuelling that. 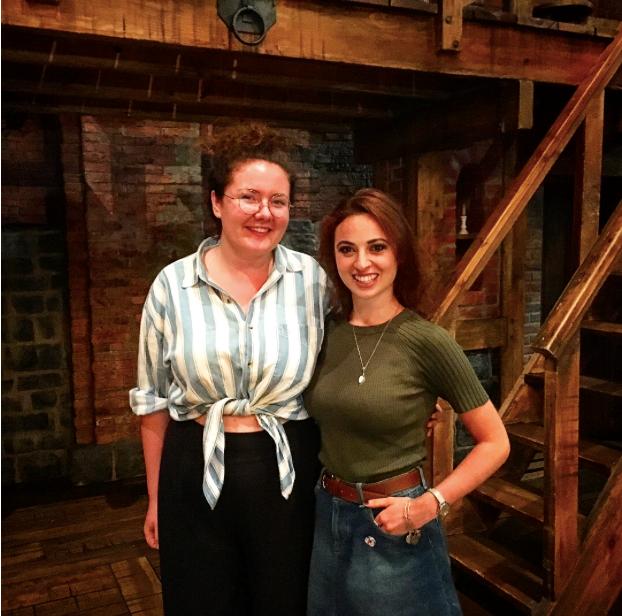 Over the course of the Summer I would not only go to multiple shows in an array of different venues and styles, I would also meet numerous Broadway stars- even serving them their coffee and lunch in the Pret a Manger branch I worked at. In a turn of events I never thought possible, my Broadway dreams came true as I was afforded a once in a lifetime opportunity to see Hamilton. The most game-changing musical of the last twenty years wasn’t even on my list of shows to try and see, I had resigned to the impossibility of seeing a show that was sold out over a year in advance. I did not wallow in this resignation, I went to other shows, A Bronx Tale, Anastasia, Waitress, The Band’s Visit. Each more incredible than the last. However, the café I worked in was nestled amongst several Broadway theatres, casts and crews alike frequented my workplace for their caffeine boosts and lunchtime refuelling needs. Every day I would meet another showbusiness professional and every day I would inform them of my love of the theatre and my desire to soak up as much as possible in what precious little time my visa continued to afford me. Slowly but surely, regular customers began to treat me to inside information, backstage gossip and promises of staff-discounted tickets. No discount was greater than that offered by Chris, a customer I had known was a sweetheart and had even known was a crew member. What I had not known was that Chris was the head lighting engineer for none other than Hamilton. In a move of pure kindness no doubt motivated by the crazed look in my eager eyes, Chris organised for myself and a friend to see the show for the far from astronomical price of only forty dollars. Hamilton was not only the cheapest Broadway show I saw all summer but the most immersive. After the show Chris continued to go above and beyond, inviting Cliona and I backstage to see the costumes, sets, props and even meet some of the cast. We left the theatre on cloud nine, ready to repeat the story of shaking hands with Broadway’s Alexander Hamilton and Thomas Jefferson to anyone unfortunate enough to ask what we did with our evening off. 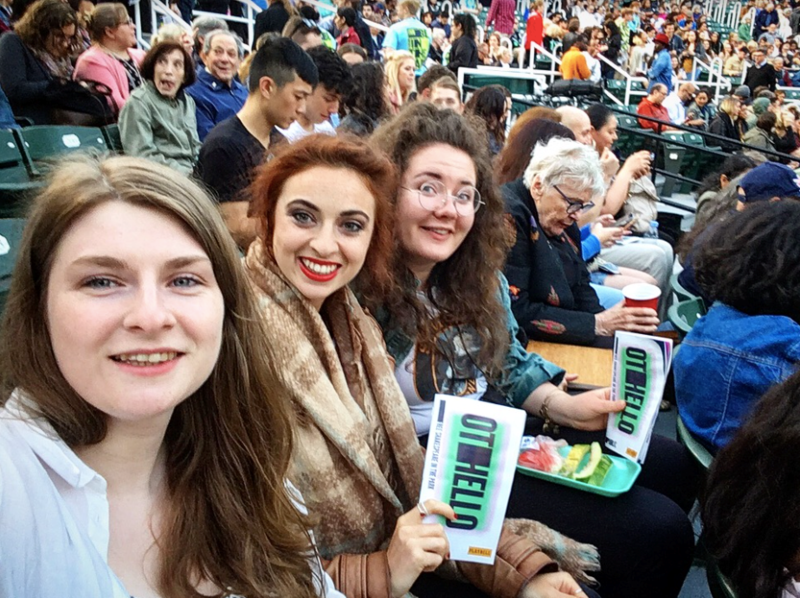 Another theatrical highlight was Shakespeare in the Park, Central Park that is. A tough morning of camping out in the queue won us tickets to the famed production – this year we were thrilled by a superb performance of Othello. We filled the time between queuing and attending the show with rowing boats on Central Park’s beautiful lake under the glistening New York sunshine. A picture perfect day spent with great friends. That glowing sentence could be attached to many of my J1 days, nonetheless, as is perhaps unavoidable, there were moments when homesickness was apparent. I noticed this whenever Irish people came into the café and I jumped blindly and headfirst into the opportunity to speak at that breakneck pace only inhabitants of the Emerald Isle could hope to understand. We would laugh and indulge in the chance to discuss the weather with as much seriousness as a death in the family- I have yet to encounter another nation that gives so much weight to the discussion of the weather, it is the only topic that Irish people never joke about. Nothing was missed more than Irish produce. As the supply of Barry’s tea I had brought with me dwindled I had to take matters into my own hands. One fittingly rainy day I made a pilgrimage from Brooklyn to Queens, specifically to the Butcher Block, a one-of-a-kind deli and grocery that specialises in Irish produce. I stocked up on Barry’s, Heinz beans, McVitie’s biscuits and most importantly of all, a proper loaf of brown soda bread- an apparently foreign concept to the American consumer. Bags in hand and bread in mind I finished this day of Irish indulgence with a fine dinner of pure comfort food, another reminder of home, a ham and cheese toastie and chips, simple but a classic. If theatre defined one half of my experience, food defined the other. The aforementioned toastie was from a restaurant that specialises in grilled cheeses. The J1 allowed my taste buds to travel the world- Vietnamese banh mih, Italian pastas and pizza, Lebanese manousheh, Chinese dumplings and noodles, Cuban octopus and Peruvian rice delicacies, Swiss cheese, Ukranian sausages and Himilayan pastries. The city of New York was a doorway to a world of gastro-experimentation and I let no meal go to waste, I had a list that needed ticking off after all. New York was both an extended holiday and a short-term home, for every visit to a new restaurant there was a quick stop in the local deli for a late night batch of home fries, for every night on the town, there was a corresponding night of laid-back domestic bliss in the apartment, as four best friends playfully fought over which show to binge next and which of the Queer Eye guys we would get along best with. My J1 experience will never be forgotten and the friends I went with became the family I chose. They will hopefully remain in my life for many years to come, always on hand to make new memories. If I had any advice for the J1-ers of years to come, it is to do it. However unachievable it may seem, work hard, save your money and just do it! Sort out your accommodation first, no-one wants to spend a week making the horror of living in a twenty-four hour McDonalds a reality. If your J1 location of choice is New York, once you have an apartment in the bag, begin emotionally preparing yourself for the eco-system that apartment will come with, furry and multi-legged friends are part of summer in the city- you have been warned. Let this be an excuse not to spend your summer just working and sleeping, get out of the house and explore the city you spent all year looking forward to. Try foods they don’t sell at home, go to an independent cinema or take in a night at the theatre. Challenge yourself and allow some personal growth to creep in. You may find, as I did, that the J1 programme allows you to learn as much about yourself as about the new city you call home. To quote the late, great Anthony Bourdain, who sadly passed away during my own J1 experience, “If I am an advocate for anything, it is to move. As far as you can, as much as you can. Across the ocean, or simply across the river. Walk in someone else’s shoes or at least eat their food. It’s a plus for everybody”. So make sure to travel after and even during your J1, take this opportunity to see a new world and maybe discover a new you in the process." 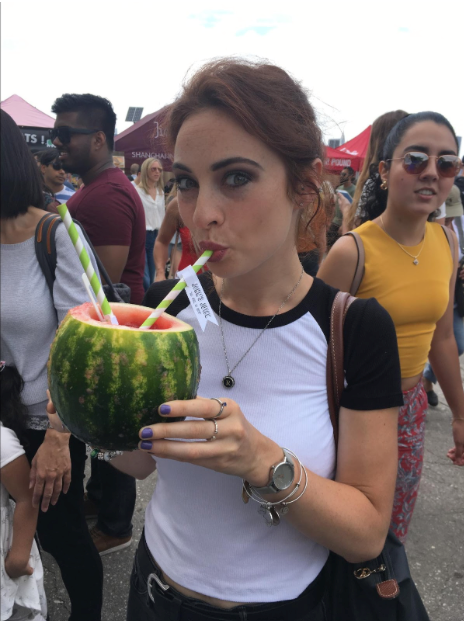 Read more blogs: Julianne's San Diego J1 Experience, Mike's Chicago J1 Experience, 5 Tips For Making The Most Of Your J1 Experience, 5 Useful Mobile Apps You'll Need On Your J1, J1 Jobs: All You Need To Know, Myrtle Beach J1 Experience, Mark's J1 Summer Of Sport In Chicago. 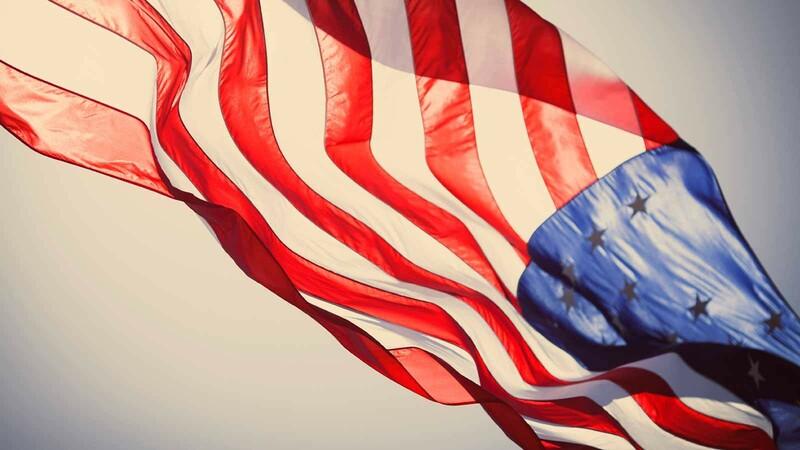 Contact us: SAYIT J1 Cork +353 21 4279 190 or J1visa@sayit.ie. Dublin: +353 1 608 0072 or dublinJ1@sayit.ie.